It is just about time to start a new Daily Drill Section. I have a lot of video clips from pro teams and groups both men and women. Some of the drills, games, transition games, shoot-outs, fitness drills have been posted before with younger groups in the video or different pro teams. If this is the case then I will include previous video links. Everyone adds a little wrinkle, whether it is starting in a different place on the ice or adding a task. The table of contents for drill section 13 are in the pdf. posted below. Links to the videos on YouTube are not on the postings so I have attached a pdf. with the links to YouTube video of the drills. Defense play a tight gap and delay the play. Slide to the outside of the near post when the play gets deep. Attack with speed and make the first pass early then read the D.
Defense make a breakout pass and follow the 2 on 1 ready to defend the next 2-1 in the other direction. 1. D1 pass to either F1 or F2. 2. F1-F2 attack vs. D2 and D1 follow. 3. On whistle D3 pass to either F3 or F4. 4. F3-F4 attack 2-1 vs. D1. *Game situations up to a 3-2 can be practiced with this drill. Defense skate between the dots. Make a hard breakout pass. Slide if attacker has only one option. Forwards attack with speed and make the first play early. Crash the net for rebounds. 1. On whistle D1 get puck behind net, skate to Big Ice and Pass to either F1 or F2. 2. F1-F2 attack 2-1 vs. D2. 3. Coach give a definite time like 10" for the attack then blow the whistle. 4. D2 get a puck from behind the net and pass to either F3 or F4. 5. F3-F4 attack 2-2 vs. D3. Face the puck. Forwards attack with speed. D stay in the middle and deny F to F pass. Forwards make the first play near the offensive blue line to force the D to make a decision. D delay the play as much as possible. 1. F1 and F2 attack vs D1. 2. F3 and F4 support D1 as far as the hash marks. 3. D2 support F1 and F2 passively from the point. 4. D1 make a breakout pass to F3 or F4. 5. F3-F4 attack D2 in the other direction. 6. F5 and F6 support D2 and D3 support F3 and F4. 8. Add a D to make it a 2 on 2. There could be active support with a 2-1 in the neutral zone and a 3-3 at each end. Another option is to combine active and passive support or add dump ins and regroups. I still don't see very many transition games used in practice. These games are much more realistic than situation drills that use many pucks and start with a whistle. These traditional drills are great for introducing a concept or practicing a technique and the logical progression is to put the situation into a one puck transition game where the attackers fight for the rebounds and loose pucks, instead of simply going back to the line-up or getting a new puck on the whistle. The defenders must regain the puck and make a breakout pass. The support from the new players can be passive, active or some players passive and some active. I will start with a 2-1 drill and then the same situation where Detroit plays a 2-1 transition game with passive support and then moves to a 2-2 situation. Transition games can also be used to teach offensive and defensive team play concepts i.e. A 2-1 with active support creates a 2-1 through the neutral zone and then for a few seconds in the offensive zone. Two new defending forwards join the play from the line-up and F1 helps the D1 low in the zone to make it a low 2-2 and F2 covers the new offensive D who joins the attack. Now it is a 3-3 in the zone. After a goal or a breakout pass the two new forwards now attack the new D 2-1 through the neutral zone and attack the other net and they get support and play a 3-3 at the other end. This repeats itself end to end. The coach can add players to create situations like a 3-2 through the neutral zone and 5-5 at each end. He can add regroups, or dump-ins which create loose puck situations. There are two pdf's attached at the bottom of this posting. The first has these links and the second has descriptions and diagrams for all of these transition games. 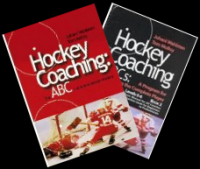 http://www.hockeycoachingabcs.com/mediagallery/media.php?f=0&sort=0&s=20131126182356890 - IIHF seminar with Wahlsten and Yursinov. http://www.hockeycoachingabcs.com/mediagallery/media.php?f=0&sort=0&s=20140706173523451 - Pro camp and F's come down to support. Hockey training can be done without a lot of equipment or expense. These videos show young hockey players and some older players from Finland, Sweden, Russia, Holland, Canada and examples from Spain and Holland with soccer-football players. We have to teach the players about angling and then progress to checking. The new Bantams didn't have body checking the second year of Pee Wee, so it is important to learn angling first. These are some good video examples. B5 - Angling Prospect – a walk through stressing a good stick and the approach. C2 Angling 2-1 Wally – Canadian Women’s Olympic team 1-1 and then 2-1 angle and create loose puck. DT400 Half-ice Transition 1 on 1 - Juuso-Yursi - IIHF Symposium – Angle when he puck is dumped in. DT100, 1 - 1 Passive Support D Join Rush and F Backcheck-Juuso, Jursi – Add dump-in and forecheck. D200 Angling Game – U18 Girl’s demo with a cross ice game. D200 Straight on Angling Game – U18 Girl’s in a cross ice game. Click on this link to get quick access or open the pdf. at the bottom of this page. The two attacking forwards play attack 2 on 2 and then play a low 2-2 vs. the two defenders. 1. Forwards line up on one side and defense on the other. 2. Start with a 2 on 2 attack F1 and F2 vs D1 and D2. 3. When the puck enters the zone defensive Red F1 and F2 give passive support from the mid-slot area and attacking team Blue D1 and D2 support F's. 4. Play 2 on 2 low in the zone. 5. If the puck is dumped out with no possession the offensive team regroup and attack again. 6. The supporting players who joined the play now go 2 on 2 in the other direction. 7. F2 - F3 support D1 and D2 and D3 and D4 support attacking F1 and F2. The first video is a demonstration by Wahlsten and Yursinov at an IIHF seminar. They stat with 1-1 and then to practice loose puck situations they dump the puck in. The players then move to a continuous 2 on2. The second video is a pro camp. The new forwards come in the zone lower and help on loose pucks. Make hard passes, give a target, keep skating while making plays, follow shots for rebounds, stop at the net, screen. Start at both ends with players on each side of the net and pucks in all four corners. 1 – D1 start by skating up an back get a puck and bank pass behind the net to D2. D1 goes to the corner. 2 – D2 pass to F1 breaking along the boards. 3 – F2 skates to the big ice between the dots and pass to F2. D2 follow then circle back to the corner. 4 – F2 skate down and shoot then skate to corner. F1 skate around the middle circle for a pass from D2. 5 – D1 bump a puck to D2 who skates between the dots and pass to F1 who skates down ice and shoots. 6 – D2 then follow the play up the ice and get a pass from F2 in the corner then drag and shoot – F1-F2 screen. Same drill with agility skating added. Defense must have quick feet and drive skate behind the net and make a good pass from between the dots. D in front must recognize he is third man and join the 3-1 rush. 1. D1 skate up to the top of the circle and back and to up a puck then wheel behind the net. 2. F1-F2 come into the zone from each side for a breakout pass, D2 starts in front of the net. 3. D1 make a breakout pass and D2 joins to make 3 on the rush. 4. Attack 3-1 vs. D3. 5. Give a time limit to score and then the repeat the other way with F3-F4 and D3 attacking vs. D1 who follow the rush to the far blue line. Approach the puck carrier from slightly behind angling toward the back of the inside shoulder with the stick on the puck and body on body. Skate through the hands with the inside leg in front and pick up the loose puck. 1 - Players line up just outside the blue line near the dots, puck are in each corner. 2 - F1 leaves and picks up a puck in the corner then skates up the wide lane. 3 - F2 follows from slightly behind and steers F1 along the boards. 5 - F2 angle checks F1 with the inside leg in front then picks up the loose puck. 6 - F2 skates into the slot and shoot - rebounds. 7 - F2 picks up a puck from the opposite corner and F3 becomes the checker. Attack with speed and do everything with quick feet. 1 - Simulate a neutral zone turnover with blue F1 pass to the red D1 and then forecheck. 2 - D1-D2 hinge and up to a forward. 3 - Red forwards attack 3-0. 4 - Red F1 get a puck from the corner cycle back to F2 who passes to D1. 5 - D1 fake a shot and pass to D2 who one times a shot – F1 and F2 go to the net. 6 - F3 get a puck from the other corner and repeat passing to D2. 7 - The high forward get a new puck on the whistle and pass to start the drill again. *Alternative idea is when the puck is at the point one F screen, one F be a shot pass option and one F be a one timer option. All go to the net on a shot. Quick feet as soon as you get the puck. Use head and shoulder fakes to freeze the defenders and goalie. One touch shots. Always give a target. 1 – After the initial rush F1 get a puck from the corner, cycle high and pass to D1. 2 – D1 skate hard to the mid-point and pass back to F1. 3 – D2 skate in for a Back Door pass from F1 and shoot. 4 – Repeat from the other corner with F6 passing to D2. 5 - F1-F2-F3 dump the puck in and try to score vs. five blue defenders. 6 – Blue defend and breakout 5-0 and attack the red net. Work on individual technique in groups. Find a space on the ice that doesn’t interfere with other players and you can practice the skill. 1 – Goalie practice – the coach pass to a player behind the net who makes fakes while the goalie practices looking over his shoulder. Pass out front for a one timer. 2 – Groups of 4 or 5 players play keep-away starting along the boards protecting the puck. Keep moving into the group with the puck while the other players poke check. 3 – Practice taking face-offs at a neutral zone face-off dot. 4 – Coach pass from the corner to the point while onne player screen and tip in front and then pass across to the far dot for a shot. 5 – Zig-zag across the ice from the blue line to the red line in the neutral zone. On backhand receptions, keep the stick blade square to the puck and hands away from the body. Follow through at the target on passes and shots. Play in the triple threat position. 1 – Figure 8 relay across the neutral zone with a pass at each end. 2 – Figure 8 agility skate with one pass. 3 – Receiving backhand passes with a partner. 4 – One touch shot while skating. 5 – Defense agility skate and shoot the forwards take a one timer. Far wing get right up against the wide D and get the puck past him. Important for D1 to drive skate to the back of the net. 1 – Set up for a defensive zone face-off. 2 – Centre draw the puck back and D1 on wall go back for it. 3 – D2 skate for a pass from D1. 4 – C support swinging across the middle, far wing up the boards other wing stay wide. 5 – Attack 5 on 2 with a middle drive and play until the whistle. 6 – Neutral zone regroup with D.
7 – Attack again 5-2 and coach give a time limit to score. •	Repeat from both sides. The defenders must read even and outnumber situations and the star and then recognize their responsibility on the 3 on 5. Players wait outside the blue line and the coach changes the situation. 1 – Dump the puck in and start with a 1-1. 2 – Add an offensive player for 2-1. 3 – Defenseman comes in for 2-2. 4 – Add a new attacker for a 3-2. 5 – Three defending forwards come in and defend the 3-5. *With younger players if I was teaching dzone I would have F1 come in and play a low 3 on 3 and then F2 in the mid-slot and F3 the puck side point. Looking at the same drill thinking about the offensive attack. Skate all the way to each line before going the other way. A good practice is to always face the same wall when stopping so you do it each side. At least 4 groups. Can be a fitness test. 1 – First blue line and back. 2 – Red line and back. 3 – Far blue line and back. 4 – End and back. Defender must always recognize the most dangerous attacker and deny plays that cross the mid-line. With the goalie it is really a 2 on 2 so expect the goalie to cover half the net. Attackers make quick plays vs. a sliding as opposed to a square goalie and crash the net for rebounds. Forwards in the corner and at the far point and Defenders wait outside the blue line. 1 – Coach pass to either F1 or F2 in the corner. 2 – D1 play a 2-1 until the puck is out of the scoring area. 3 – Coach whistle and pass to F3 at the far point who attacks 1-1 vs. D1. 4 – Repeat with new players. *You can run this drill at both ends at once and switch to a 2-1 from the point and 1-1 from the corner. This is one of the most commonly used drills that I have seen used by pro, junior, international teams around the hockey world. It is usually done 1-1 to a 2-2 but other variations are possible with the same flow. There are 3 video examples. Two with Flames teams from different seasons and one at an NHL prospect camp. The coach can duplicate the same situation in a transition game by having the D join the next rush and the F backcheck but I don't see this done much even though it is more game-like. Instead of defense and forwards have everyone play both by having half the blue defend at one end and the other half at the other. Reds will be opposite. Now everyone practices all off the offensive and defensive skills needed in the game. Randomly send out 1 or 2 defenders and 1,2 or 3 attackers. Now the situation is different every time and the players have to ‘Read and Act’ according to the situation. Every numerical situation will be created. Give a time limit for a rush to score and keep score Red vs. Blue to increase the competitiveness. To practice loose puck situations practice dump in’s which cause the attackers to forecheck and the defenders to break out. D join the attack on the whistle and attacking forwards back check. It is a fight for inside position. No penalties. Important that the forwards touch the red line so F1-D1 are close enough to join the play. 1. Blue D1 pass to Red F1 who skates to the red line and turns back attacking 1-1 vs. D1. 2. On the whistle Red D2 passes to Blue F2 at the other end of the rink. 3. Blue F2 skates to the red line and turns back attacking 1-1 vs Red D2. while Red D1 Joins Red F1 on the attack and White F1 backchecks making it a 2-2. 4. Repeat with Blue D3 passing to Red F3 at original end. *Situations up to a 3-2 can be practiced. You need at least 8 D and 12 F to practice 3-2 with a 5-5 at each end. With larger number the lineup needs to move up to the blue line and start with a pass in the neutral zone. Another example with the Flames. Attack quickly and create 2 on 1 situations and shots that make the goalie go post to post. Defend and make it a 3-3 with the goalie making him only cover the strong side of the net. 1 – Start with a dump-in by the coach from the blue line. 2 – One defender be aggressive on the loose puck. 3 – Second defender read the next play. Attackers create 2-1’s and triangles. 4 – Attackers outnumber the defenders on loose puck battles. 5 – Defenders must maintain the defensive side. 6 – Coach should set a time limit, i.e. 10-20” to score. 7- Give and go passes are the attackers best weapon. *Always read, ‘should I pressure or contain. As long as the attack stays on one side it is a 3-3 and the goalie is responsible to make strong side saves. I went to a seminar yesterday that had video demo’s of puck handling. The only problem was that the players had rigid upper bodies and everything was from the forehand side to straight in front. The backhand side was non-existent. Here are some videos from Europe that show how to develop loose shoulders and the ability to handle the puck all around the body. This is Vladimir Yursinov’s puck handling warm-up demonstrated by Yashin who was the Russian captain and for NHL MVP. Big moves, loose upper body. Yursinov is recognized as the top skills coach in Europe and more than 60 of his former players have moved onto the NHL. Yursi’s teams do this at the start of practice as a warm-up. I saw this when he had me run a checking practice as a guest coach for TPS in Finland. I was lucky enough to coach with him on the Red Bulls staff where he came one week a month to work with the players. The next video of Yursi teaching a sequence that leads to the Ovechkin move. Yursinov teaching a puck handling sequence to U17-U20 players in Austria. The third video shows players at the training centre in Vierumaki, Finland handling the puck all around the body. A - Crosby Turn - Crosby with Push – Sweden – Face the play while carrying the puck. Pass while skating without coasting first. Make firm passes and keep the stick blade square to the puck. 1 – Players in all 4 corners with the pucks on one side. 2 – On the whistle one end leave and pass outside of the dots and the other end pass inside the dots. 3 – Shoot at each end and follow the shot for a rebound. Defense make the pass while skating between the dots up ice. Forwards give a target and do everything while skating. 1 – D1 at each end skate from the goal line to the top of the circle and back then get a puck. 2 – F1 and F2 leave from the blue line and come back for a breakout pass. F2 mirror the puck across. 3 – D1 pass to either F1 or F2 and D1 follow the rush up the ice. 4 – F take the ‘big ice’ between the dots and then pass wide. 5 – F make a wide zone entry and shoot-rebound. 6 – Non shooting F get a puck from the corner and pass to D1 at the point who drags and shoots. 7 – F who passes either go to the net or cycle high as a passing option for D1. 8 – Repeat with D2-F3-F4 at each end. Players transition from Role 1- puck carrier to Role 2 – puck support to Role 3 – check puck carrier to Role 4 – defend away from the puck. Good habits like giving a target, face the puck, get open, skate to open ice with the puck are practiced. 1 – Play 2 on 2 and each team has one Joker behind each net. 2 – When you regain the puck you must regroup with the Joker behind the net. *Option: Jokers can check Jokers and the players on the sides can be activated to also be eligible for passes. Face the puck, give a target, do everything while skating, firm passes, hit the net and follow shots for rebounds. 1 – Coach pass to a F who regroups with a D to start a 5-0 regroup. 2 – D hinge and pass up to a forward who head mans the puck and that F goes in for a shot. 3 – Coach pass to F who regroups and D hinge and pass up F to F who attacks and shoots. 4 – Coach pass to F, regroup, hinge and up to third F who attacks the net and shoots. 5 – Coach place puck for wide D who skates to line and takes a point shot. 6 – Coach place another puck for the last D to pick up and take a point shot. T - Teaching drills and games where the coach is controlling the situation and giving instruction on individual skills or team play. The letter tells what is being worked on. The number behind the letter tells what the area of the ice it is being done in. A1 – cross ice A100 – cross ice with a puck. (ind. Or skating skills cross-ice and then cross-ice with a puck) A3 – around the rink. A300 – around the rink with a puck. Etc. The same happens with all the drills and games. i.e. D1 – Full ice. D100 – Full ice with extra players on the side or in the box. D2 – Cross-ice game. D200 with extra players rotating in. D3 – one cross-ice game and another game from the goal line to the far blue line. D300 with extra players rotating in. D4 – one zone game and D400 with extra players. D5 – A D4 game at each end and a D2 game in the neutral zone. D500 with extra players. D6 – Full ice with two nets on each goal line making two full ice games at once. D600 with extra players. D7 – ¼ ice games with two nets on each goal line. D700 extra players rotating in. D8 – Four games at once with two nets on each goal line and two nets near the red line. D800 extra players. (good to have a hose, boards or rink divider along the red line.) Good game formation with smaller players. DT - Transition Games are coded in a similar way. This drill was posted before with the Czech U17 National Team with Petr Svoboda coaching. The pro's now do it and there are two video clips with them. The Czech go without whistles and the pro's use a whistle. It is a good warm-up drill requiring a lot of agility skating and skills. I mentored the coaches and Petr (NHL defenseman for Toronto) in 2010 and Petr was the only one who spoke English and did all the translating with the HC Dukla Jihlava team which is a city about 90 minutes south of Prague. Keep skating, give a target and pass hard and pass while moving. Hit the net and follow the shot. Rebound for the next shooter. 1. All players and pucks are in the middle. 2. One player leave from each side. 3. Player 2 pass to player 1 who circles between the red and blue line. 4. Player 1 skate in and shoot after the third pass. 5. After shooting player 1 circle back and rebound for the next shooter. 6. Alternate sides and player 3 leaves after the first pass. 7. Circle left and right so shots come from both in the middle and the outside lanes. * The first video demo is the Czech National U17 Team and the next two are with pro players. All times are GMT. The time is now 12:34PM.